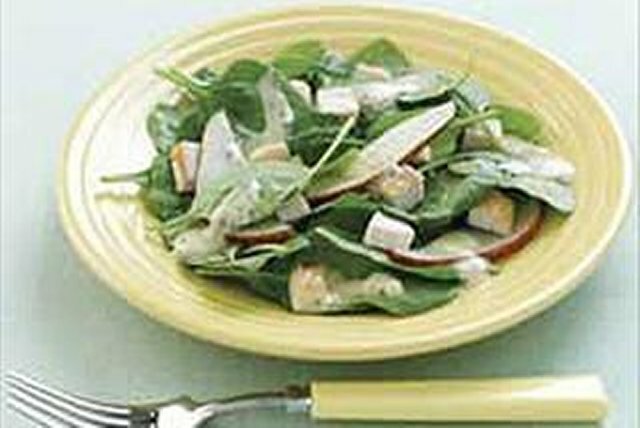 Pour dressing over combined pears and chicken in large salad bowl; toss to coat. Prepare as directed, using Kraft Balsamic Vinaigrette Dressing and adding 1/4 cup Kraft Greek Shredded Cheese. Pour dressing over pears and chicken as directed; cover and refrigerate until ready to use. Toss with spinach just before serving. This superb salad is an excellent source of vitamin A and folacin and contains a high amount of fibre.